Pday has been really fun today. On our mission we cant do any activities really so its basically just lounging around... kinda lame... but if we have more success hopefully that will change. But we went to Centro (downtown bahía) because i had to get a couple of things. BUT i bought this legit Argentine Jersey!!! Its not Messi but its just an Argentine jersey (no number on it) but I love it. It was fun to walk around downtown and see Argentina alive. My area is super small and not as developed so it was cool. It was weird walking on sidewalk and seeing paved roads. But i love my area Maldonado. We are finding more investigators! we found about 3 or 4 more this past week and we are still working hard to find more. I had a little bit of a slower week because I got sick last tuesday and wednesday. I had a little fever and my throat really hurt... I was scared that I was going to get strep throat.. Luckily it didn´t put me down much and I didn´t lose too much time working. General Conference was absolutely incredible!!! I received answers to all of my questions and I seemed to be able to get more out of it than ever before. It was funny when they started talking about how the men need to get married. All the missionaries with me with like a few months left were taking super notes and were gettin a lil trunkie. It was funny. So ya we got to watch all the normal sessions in english. 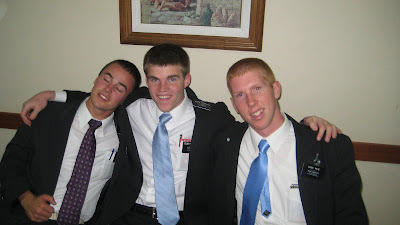 but the priesthood session we watched in Spanish. In between sessions on Sunday there was a baptism for a lady named Yoanna. She lives in the area that I worked in a little bit my first week with the trio in White. 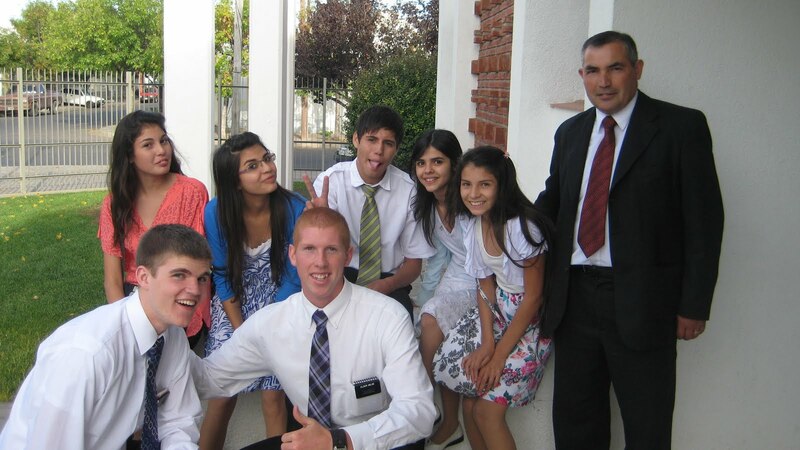 My first lesson in Argentina was with her so it was kinda cool to see her get baptised. Our house has been flooding! one of the pipes has like three tiny holes. Luckily most of the pipes aren´t covered so it just all goes out on the floor. But every time we get back to the house we have to take the squeegie and push all the water out. the water is turned off right now... so hopefully that gets fixed soon. One thing I really miss here in Argentina is carpet! In our area there is absolutely no carpet anywhere (because its all dirt and dust) so its funny at conference when we went to the big stake center in bahía the room we were in had carpet. I loved it. The Castellano hasn´t improved much this past week. 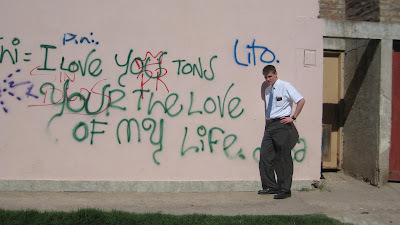 But for part of my studies i read and translate a chapter of the book of mormon a day. I also carry around a notebook and write down words or phrases that i hear and look them up when i get back home. I was able to talk alot in my last lesson though so that was great. Itw as with Gloria. She had a son with cerebreal paulsy who died when he was 19 and it was a really sad story. The spirit was strong. 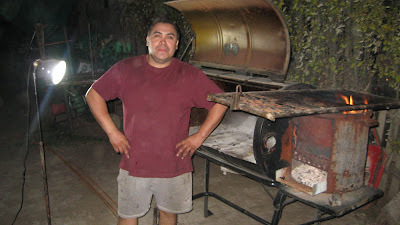 Well I´m glad to hear everything is going well back home in el estados unidos. Not really sure if there is anything else to write yet. but All is well here. I included a some pictures. 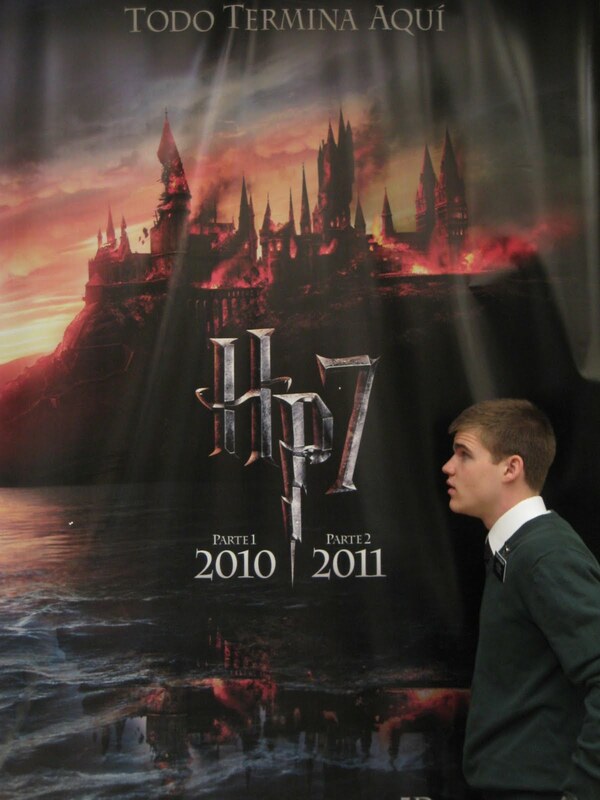 During pday today we walked by a super huge harry potter poster... so we had to take a picture... i cried because i am going to miss part 2. 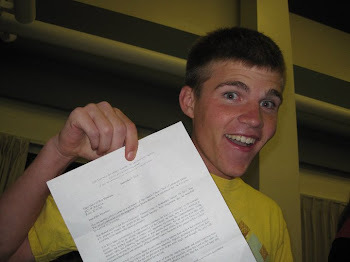 There is a picture of one of the counselors in the bishopric with his grill. He made us super good chicken. But thats his career is making those grills. I thought Dad and Uncle Jan would be interested in that. Then the red head is my comp :) hes great. The one with me my comp and elder hatch (that was my trio for the first week) The one in front of grafitti was cool because it was in english! This blog is ran by Max's mother Kristi. 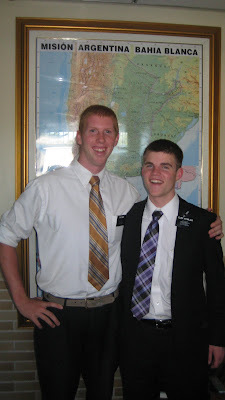 Max begins his mission at Argentina Bahia Blanca January 19 with his sister Clare who will be going to Tirana Albania.